Has Port kissed its flag hopes goodbye after trading Chad Wingard? PORT Adelaide won't die wondering. How many other clubs would let a dual All Australian in Chad Wingard explore his options, and ultimately depart while under contract, while also allowing their best outside runner in Jared Polec move on? The Power don't have time to waste. They were aggressive in last year's NAB AFL Trade Period when they brought in Tom Rockliff, Steven Motlop and Jack Watts. The two years prior they recruited ruckman Paddy Ryder and key forward Charlie Dixon. Next year, they will have 12 players age 28 or older, and four – Ryder, captain Travis Boak, superstar Robbie Gray and reigning best and fairest Justin Westhoff – who are over 30. BEST 22 How does your club look after Trade Period? The Power are going all in for the next two to three years, which they have to do, since they haven't won a final since 2014. At the same time, two of their best players in Polec and Wingard – who finished fifth and sixth respectively in this year's best and fairest – are gone. The Power believe their list will be stronger, and they might be right. Scott Lycett is a great pick-up. He gives the Power a genuine second ruckman and takes the load off Ryder, who struggled with Achilles and hip injuries this year. Ryder can be dangerous playing as a deep forward as a one-two punch alongside Dixon. Lycett showed at West Coast he can also play forward. Polec was brilliant at times this year. His outside run cut opposition teams to shreds. He was a metre-eater. But the Power were reluctant to hand him a lucrative five-year deal given his injury history, although he's only missed one game in the past two seasons. Wingard is a different proposition. He played his best football as a half-forward, earning All Australian honours in 2013 and 2015. The past two years, his role became split between half-forward and the midfield. While he had games where he dominated, he didn't perform that role consistently. "He felt like he'd got to a position where he was a bit complacent and stale," Power general manager of football Chris Davies told Adelaide radio station FIVEaa. "From our perspective, (coach) Ken (Hinkley) was asking for some things from him for 2019 that he thought he might not be able to deliver. "So, we get to a point where the decision needed to be made." 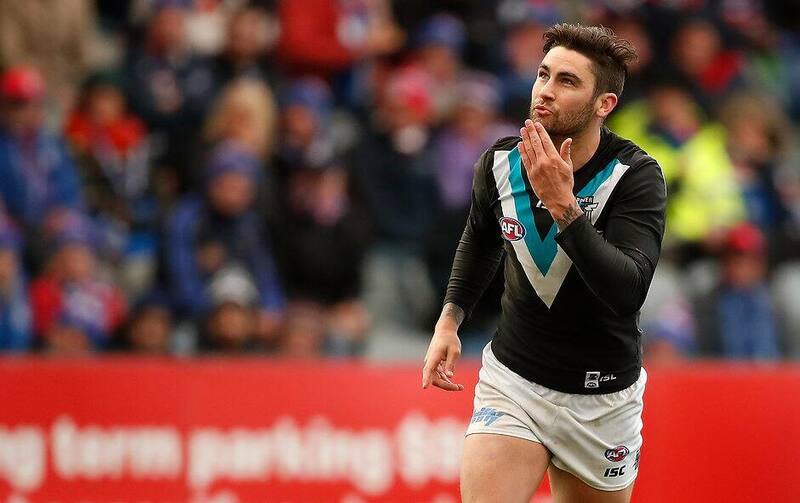 Another consideration in the Wingard deal was he was due to become a free agent next year. The Power knew they would get a better return if they traded him this year, rather than wait for a compensation pick if he left as a free agent in 12 months' time. The Power want to be in the finals, so the compensation pick would've likely been between picks 11-19. Replacing the outside run of Polec and forward speed of Wingard will be difficult. From their own ranks, Dom Barry has the pace to play on the wing, and showed glimpses of what he can do in his handful of games this year. Kane Farrell is a lively half-forward prospect as displayed in the round 20 Showdown, booting three first-quarter goals. But the Power will also address that need in the draft. Highly-rated South Australian Izak Rankine would be ideal, but it's far from guaranteed that he'll slide past Carlton, Gold Coast (twice) and St Kilda to reach Port's pick No.5. AFL.com.au's draft expert Cal Twomey has Rankine as the third-best prospect in the draft behind Sam Walsh and Jack Lukosius. The Power currently hold picks No.5, 10 and 15 after shrewd work during the trade period but they have to be wary of cross-town rivals Adelaide, who will try to move up into the top five. With picks No.8, 13, 16 and 21, the Crows could hold talks with St Kilda about its pick No.4, or Gold Coast, which holds picks 2 and 3. Outside of Rankine, fellow South Australian Connor Rozee would help with their need for speed after he ranked second in the 20m sprint (2.91sec) at the Draft Combine. He's also more likely than Rankine to be there at pick 5. Zak Butters, Ian Hill and Curtis Taylor also fit the bill. At 11-4 after 15 games this year, the Power looked like world-beaters. It then all collapsed like the Australian cricket batting order on the sub-continent, losing six of their last seven to miss the finals. The jury is rightly still out on the arrivals of Rockliff, Motlop and Watts. So far, it hasn't worked. Rockliff was hampered by knee and shoulder injuries and spent time in the SANFL; Motlop was brilliant in patches and average in others; and Watts showed why the Demons were happy to let him go for pick 31, finishing 21st in the best and fairest despite playing 20 games. Watts was brought in to help with the ball delivery into the forward 50. A move to the wing, rather than having to take contested marks at half-forward, could help play to his strength. There's also been change in the coaching department. Long-time senior assistant Matthew Nicks has moved to Greater Western Sydney and forwards coach Brendon Lade has gone to St Kilda. Midfield coach Michael Voss essentially replaces Nicks and 2004 premiership players Jarrad Schofield and Brett Montgomery return. Schofield – after guiding Subiaco to three successive WAFL flags – takes over the Power's midfield, while Montgomery will look after the forwards. In an interview after he joined the Kangaroos, Polec suggested the game plan didn't suit the players this year. "I don't think the recruiting was off, I just think we played to a certain structure that didn't quite work well for our side," Polec told Channel Nine. "We tried going a new way, tried to structure a bit differently, but it didn't quite work. "Things did work to that structure, but changes will be made at that club and they'll be better off for it." Getting Hawthorn defender Ryan Burton in the Wingard deal was a win for the Power, while a move back to South Australia could get the best out of Brisbane utility Sam Mayes. With the Trade Period sorted, the club will turn its focus to the draft. It's the first time the club has had three first-round picks since 2009, when it added John Butcher (pick No.8), Andrew Moore (No.9) and Jasper Pittard (No.16). The trio combined for 212 games, 126 of which came from Pittard. Pittard's move to the Kangaroos, as the steak knives in the Polec deal, means all three have left the Power. It's proof that having high draft picks isn't a guaranteed recipe for success, but they can help fill the holes in the Power's list. Along with outside run, Port's main deficiencies are how they move the ball into attack and the amount of times they turn the ball over. Burton could be handy across half-forward in the role that Watts hasn't been able to make his own. Mayes plays a similar role to Burton. While Mayes probably isn't in the Power's best 22, he's shown enough in his 101 games with the Lions he has the potential to be a solid addition. The Port Pirie product – the eighth overall pick in the 2012 national draft - should also get the best out of his football by returning to South Australia. The Power have been ruthless in their list management in the past two years, but they're also willing to allow players to leave in search of greater opportunities. Pittard had fallen behind Dan Houston and Riley Bonner for a place in the backline, while Hamish Hartlett and Matthew Broadbent will return from injury next year. Jack Hombsch was in a similar predicament with Tom Jonas, Tom Clurey and Dougal Howard holding down the key defensive posts. One of the most popular figures at the club, Hombsch was traded to the Suns for a future fourth-round pick. Fringe players Brendon Ah Chee (West Coast), Logan Austin (St Kilda), Matthew Lobbe (Carlton) and Aaron Young (Gold Coast) were traded out last year, along with Jarman Impey (Hawthorn), who wanted to return to Victoria for personal reasons, and respected utility Jackson Trengove (Western Bulldogs). The Power's top end of talent is elite. Four-time All-Australian Robbie Gray is one of the best small forwards in the competition, Jonas rarely gets beaten one-on-one and Wines is an animal in tight when the ball is up for grabs. But if they're going to have success, the Power will have to do it soon. The challenge is in front of coach Ken Hinkley, who last year signed a three-year extension until the end of 2021, to get the best out of what he's got. Were the first 15 games of this season a true reflection of the Power's potential, or was it all a mirage?